“Hey, how was Philadelphia?” asked Darius*, as I checked his work (“Sketch a parabola in which b=0”). “Pittsburgh,” I said, pleased and taken aback. It was Wednesday, first day back after our 4-day Veterans Day weekend. Sometime on the previous Thursday, I’d mentioned casually I was going back east for my uncle’s 70th birthday. Six days later, Darius remembered my plans. 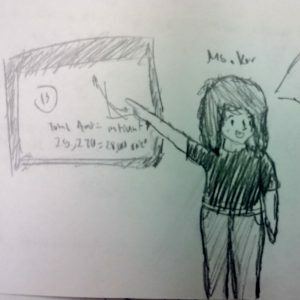 I moved back to the front, checking for universal understanding of the impact that b=0 had on the position of a parabola, and then told everyone to sketch a parabola in which c=0. “Did a lot of people show up?” Darius asked across the room. “Was the food good?” from Harres. After we finished up c=0 and they were figuring out the significance of a parabola with just one zero/solution, Darius waited again until I was checking on his work. “No one talked to me. I was like this.” and Darius humorously mimed standing all alone, silent, looking about for something to do. So that’s why he remembered. As they worked out the next task, I had a brief moment of introspection. Darius, who’s a cool cat in every sense, is far less likely to be the one sitting alone at a party than, say, me, a cranky introvert who has to brave up for crowds so she can exercise her natural garrulousness. I know that my uncles, or my dad, would have probably joked about a teenaged African American appearing at the party. Some or all of them, egged on by siblings and downstream kin, would one up each other with ribald wordplay and puns about where and who had done what when to add color to the family tree. But they’d have sought him out, gotten him some food, grilled him on his life story, likes and dislikes, found out his plans after high school. Looked for links and common interests, bring in others to get conversation going. But would I have done everything to reach out? Or would I have been too busy enjoying not being the one sitting alone? As the bell rang, I was actually showing Darius and others some family pictures from the night, which sounds impossibly boring, but they seemed genuinely interested in seeing evidence of my stories. “Well, gee, I guess at least the white side of the family didn’t ask if you were ‘all-white’.” I pointed out, and they cracked up. “Really?” Both Kameron and Darius looked interested. Such exchanges are classroom alchemy, a magical transformation of mundane, random elements into golden moments. They spring from elixirs of personalities, events, spontaneous conversations, the incidental inspired nudge. They are occasionally unrelated to content knowledge and always irrelevant to test scores. They will never be found in MOOCs, nor in classrooms obsessed with tight transitions. They are criterion deficient; ed schools can, to a limited extent, prepare teachers for such moments only with open-ended assignments that are probably opinion-based. I don’t confuse alchemy with the meat and potatoes of teaching. Darius and Kameron are both doing very well, improving their competency and fluency in quadratics, modeling real-life situations with algorithms and, importantly, taking on intellectual challenges that don’t immediately hold interest. But teachers are responsible for more than content, whether we are aware of it or not. We are the first adults students interact with, the first engagement students have with the outside world. Independent of content, we can give students a feeling of competency, of capability, or of frustration and helplessness. We can communicate values both indirectly and directly. We can teach them that work is a serious business, or we can teach them that work can be fun and entertaining—or both. We teach them how to interact with a wide range of personalities, how to ask for help, how to give help. It doesn’t matter if a teacher is determined to convey nothing but content. Simply by the nature of our job, we create an environment that has its own entirely unmeasured learning outcomes. I am a teacher who focuses primarily on conveying content, as all observers have noted over the years. Yet for a teacher who doesn’t see her job in terms of its emotional impact, I have my fair share of classroom alchemy, the moments of knowing my classroom has been a positive force in the universe, whether for one student, a group, or a class of thirty five. I never plan these moments. As the great Terry Pratchett noted (with props to Neil Gaiman), you can’t second guess ineffability. It’s just going to come along on its own terms. *Darius and Kameron both confirmed this exchange as written.